Facebook Woes? 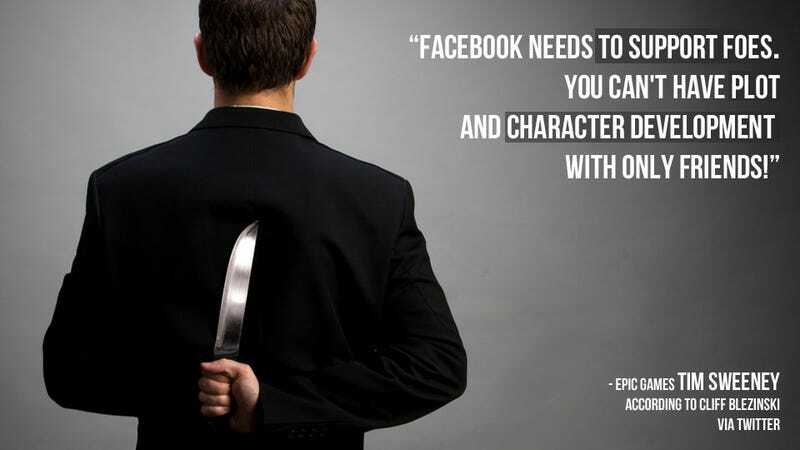 Perhaps You Need More Facebook Foes. Sometimes a frenemy just isn't enough. Sometimes it's not enough to smile when you run into each other on a mutual friend's Wall, or to make nice to someone in public and then complain about them to your partner in private. No. Sometimes you just need a foe. Perhaps, even, a nemesis. Epic's Tim Sweeney suggests that for true plot and character development, any story needs to have a foe. And that includes the story of your life... as told on Facebook. Of course, it makes sense why Facebook only has ways to codify, quantify, and acknowledge positive actions or relationships. There's enough drama all over every inch of the site without a "foe" category and no matter how often part of my secret heart sympathizes with the calls for a "dislike" button, I never particularly want or truly expect one to appear.